Spend time with your family and friends doing the things you enjoy at the beach. Our 3 bedroom plus den, 3 1/2 bath home is ready to accommodate you both in comfort and convenience. We've completely renovated the kitchen including the cabinets, counter tops, appliances, lighting and flooring and fully renovated the first floor powder room as well. Additional upgrades include new flooring in Master bath, new bedding and new window coverings! All of this is to enhance your vacation. Come, relax and play for a few days, a week or longer. ENJOY A COMFORTABLE HOME, TERRIFIC BEACH, BIKING, FISHING, MINI-GOLF, SHOPPING, WATER SPORTS, GOLF AND MORE !!! Welcome and thanks for your interest in our home. The community of King’s Grant is located on Fenwick Island, north of the municipal town limits and Fenwick Island State Park. Community Details: King's Grant encompasses townhouse units located ocean front and bay front. 47 King’s Grant, “The Shore Thing” is a BAYFRONT home, located in the northern section of the community offering larger housing units, more living space and dune and ocean views. Our unit is a 3 story town home with unobstructed views of the beautiful dunes. Ocean views are clearly visible from the second floor. The ocean beach is literally across the street. The bay is our 'back yard'. Our family began to vacation on Fenwick over 20 years ago when we wanted a slightly quieter location than Ocean City or Bethany. We've owned and personally managed the rental of our home since we purchased in 2002. The beach that we have the privilege of enjoying is directly across the street. You can see the beautiful dunes from our front porch and see the ocean from the second floor of the house. From our front porch, it takes about 4 minutes to touch sand. (Please review the satellite view available below this description for more visual detail)There is beach access through the north and south sides of the ocean units. Both beach entrances take you on a boardwalk that protects the dunes. There are outside freshwater showers to clean off after swimming. The beach is wide, uncrowded and clean. It is owned and maintained by the State of Delaware and is an unprotected, multi-use beach. Should you feel the need to be on a guarded beach, you can go south to the State park ¼ mile or north to Bethany about ½ mile. As mentioned, our home is on the bay side of the community which also includes the location of the community pool and pier. These 2 amenities have offered us another wonderful dimension to our time at the beach. The pool is situated at the edge of the bay. On the deck are several seating options including both chaise lounges and tables with umbrellas & chairs, perfect for lunch! There is also a restroom and shower. Next to the pool is our community pier which extends into the bay and is a great place to fish and crab or just hang out! My kids spent hours out there. There are 2 reserved/marked parking spaces which are located in front of our home. The spaces are within 40 feet of the front steps. Our 3 story town home comfortably accommodates up to 8 including children. When you enter our home, you can look straight through the sliding glass door to a beautiful, unobstructed Bayfront view. Standing in the foyer, the stairs to the 2nd floor are on the right, through the hallway to the left is the Den which houses a Pottery Barn queen sleep sofa & TV and closet. There is also a powder room and the hall closet with the washer/dryer/iron and ironing board and plenty of sand toys. As you continue into the house, the kitchen is on the left which includes a large breakfast bar, then the dining/living space. The kitchen is fully equipped. There are enough plates & utensils for 12 and several serving pieces, etc. We keep a basic spice pantry for those that also like to cook. The dining area includes a large breakfast bar with stools and dining table which seats 6. The living room has comfortable seating for 6 people, wireless internet and TV. Off the sliding glass door from the living room is a nice sized screened porch with a ceiling fan, table and chairs(6), live box, crab net and some crab traps. Beyond the screened porch is a beautiful 1st floor deck with teak steamer chairs, gas grill and plenty of space to read the morning paper, enjoy the stunning waterfront views or celebrate sunset with family and friends alfresco. The first floor deck is a great space for coffee in the morning, iced tea in the afternoon and a tall, cool drink in the evening. It's also a perfect spot for star gazing if you don't want to walk across the street to the beach. Second Floor: There are 2 en suite bedrooms on the 2nd floor. The Bayfront master has a beautiful view through the sliding glass door that leads to a private balcony overlooking the bay, a Queen sized bed, double sink vanity, Jacuzzi tub/shower, large closets and TV. The front (ocean view) bedroom also has a Queen sized bed, TV, private bath with a shower stall and unobstructed views of the sunrise, the dunes and the ocean. There is a sitting area off the 2nd floor hall with a large eastern view picture window and game table. You can watch the sun rise over the ocean or use our binoculars to see the freighters in the ocean at night. If neither of those activities appeals to you, you can sit there and play a game of checkers or chess! The 3rd Floor: “The Crow’s Nest” Decorated slightly whimsically, houses a trundle bed which can accommodate 2 singles or can be pushed together to create a queen bed. There is a TV and full tub/shower with separate vanity. The house is decorated in a casual, sophisticated style. The majority of the furnishings are Pottery Barn. There are ample pillows and blankets, bureaus and closets to accommodate 8 people. Linens/paper & consumables are not included. When we visit the beach, the kids and my husband either go to the pier or the beach and I head to the grocery store. We prefer not to go out every night. We like to cook and enjoy entertaining at home. Often we will spend the day with friends, enjoying the beach, golfing or riding bikes, stop by the pool in the afternoon, and enjoy a relaxing evening with cocktails and dinner on the deck. The sunset makes a great backdrop! If your idea of vacation is NOT to cook, there are several GREAT restaurants and pubs close to our house. We keep a visitors binder in the living room with information regarding restaurants, day trips, state parks, etc. Location, Location, Location!!! The beauty of this part of the island is that it is quiet and peaceful yet very close to everything. Shopping in Rehoboth is ½ hour north of the house, if you would like to go on a fishing charter, Indian River Inlet is 12 minutes north of the house or bring your kayak or canoe and put it in the bay ½ mile north at one of the state park bay beaches. Great golf is just a phone call away. It’s nice to have the option to have quiet time or hop in your car and go for ice cream or mini golf. This part of Fenwick Island is a well kept secret that we are now sharing with you. If you are interested in more information or would like to rent our house, please contact us. We are the Brennan and Riley families and we love Fenwick Island! Zoom in on the map to get a better view of our location. The sunsets are amazing!!! We chose to purchase on Fenwick Island because of its proximity from our homes Baltimore/Northern VA and the incredibly well kept secret in terms of solitude and beauty. King's Grant is a wonderfully maintained, convenient, family friendly community with terrific beach and bay access. Our home is comfortable and provides the opportunity for easy coastal living. Relaxation at it's finest. 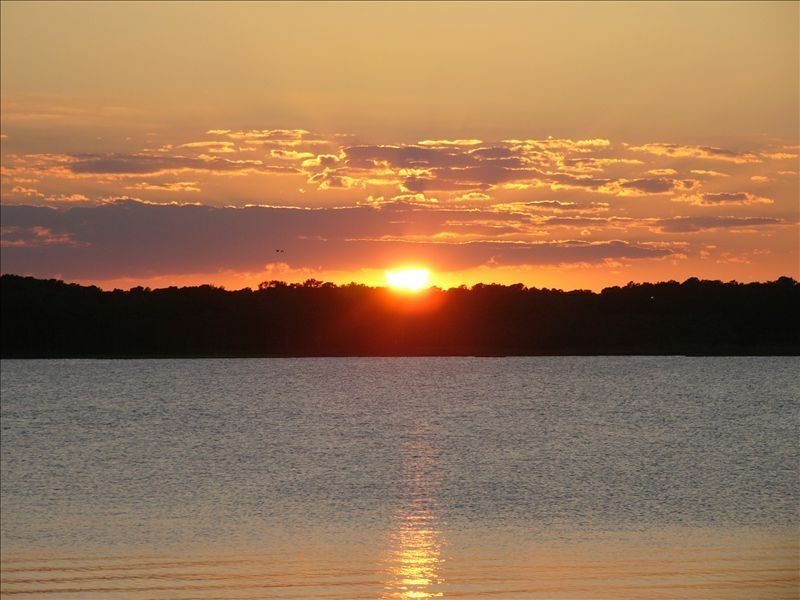 Watch the sun rising over the dunes in the front of the house and sunsets on either of our spacious water front decks. Beautiful surroundings, large sandy beaches, convenient location and very comfortable, easy accommodations. You can see the beautiful dunes from our front porch. View the ocean from our second floor sitting area, watch the sun come up over the ocean or view freighters traveling at night. Walk in the front door and look straight through the house to the lovely, quiet Bay. Enjoy fabulous sunsets! Basic spice pantry for those that like to cook while on vacation. Clean, Convenient, Coastal Comfort! Walk across the street to a lovely, beach with fresh water showers at both of the community's beach entrances. Enjoy the outdoor bay-front Pool w/ lounge chairs, tables, umbrellas & restrooms. Spend time on our pier, perfect for fishing, crabbing or just playing. Store your bikes in the exterior bike racks. 2 reserved parking spaces for your convenience. Our newly renovated kitchen & first floor is ready to accommodate you! Casual, sophisticated Pottery Barn furnishings throughout the house. Wonderful unobstructed views of the sunrise over the ocean & dunes from our second floor seating area and front en suite. Perfect waterfront views and sunsets from the balcony off the Master en suite. A lovely, main floor waterfront deck with comfortable steamer chairs perfect for morning coffee & fabulous sunsets. A large bay front screened porch with table & seating for 6+ off the main living area ideal for cocktails and dinner using our gas grill. Clean, great layout, and beautiful view! My family of four stayed here for the week of August 18-25. We found the townhouse very clean with a layout that allowed my family of four adults to have their own space as well as a living room where we could all get together comfortably. Getting to the beach was just a short walk or drive across Coastal Highway, which was never an issue since the access is directly in front of the subdivision. The best part of our stay was the view of the bay! Thank you for choosing our home for your Fenwick vacation! We are so pleased that the layout worked for your family. Easy access to the beach is one of the best features of our home, however, the views from the back of the house are probably my favorite! We'd love to have you back next summer!!! The unit was absolutely clean,fresh and perfectly updated. I’ve been coming to Kings Grant for 25 years and this unit is fabulous, not to mention the area. A no brainer. Thank you for choosing our home this summer. We are glad that the accommodations were comfortable. We are always delighted when a guest has been enjoying King's Grant for many years. That means you love it as much as we do... Please join us again! Truly outstanding shore home with lovely sunsets! It was a wonderful week on the bay and beach. The place is both beautiful and comfortable, with an brand new kitchen and nice baths. The beach and the bay are fabulous amenities! We are glad that you enjoyed the location and the renovations!. Thanks for choosing our home for your Fenwick 2018 vacation! We hope you'll consider our home for another stay! We decided to take a last minute vacation to Fenwick and this was the only unit available that met our needs.We have been visiting the area since I was a kid. my parents, my in laws, my husband, myself and our two kids. There are 3 floors.The bottom floor has an open den (no door) with a pull out sofa and a half bath.This worked well for our 6 year old.The middle floor has two bedrooms. The master has a balcony, queen bed, and a full bath with a tub.The bedroom down the hall has a queen bed and bath.Upstairs, in the loft, there is a single day bed with a trundle that can be lifted to bed height to create a queen bed. There is also a full bath with a tub. 2. The shower size in the second floor bath. It's tiny. The bathrooms really need a rehab! Dear Becca, Thank you for choosing our home for your late summer trip. I appreciate your feedback. I'm glad there were some things that you enjoyed and hope you got some great family photos. Unfortunately, the house did not meet your standards, even after sending the cleaning crew back (on Monday) to take care of whatever you needed. I am sorry for that. Since you've been coming to this area since you were a kid, I'm disappointed that you found crossing Rt. 1 an issue for you. When our kids were much younger, we drove across and unloaded. We left the sand chairs and umbrella in the car the entire week! It was all about making things easy for our family. That might be an option for future vacations you take to the area. From mid-July, we had several electronic conversations, one of which was regarding your need for additional parking. I explained that I could not guarantee an additional parking space BUT gave you specific instructions for the location of an additional third parking tag, located in our home. When I arrived at our home the morning you left, the tag was exactly where I explained to you that it would be. My reason for suggesting you use a piece of paper on the dash was that I assumed you were already using the additional tag. Flyers are used by our management company to ensure ample parking is available for the use of our owners and guests. Thanks for the interior design editorials. I'm glad you see the potential in our home. Overall my family and I had a wonderful time. Fenwick Island is the perfect location. The beach is a short walk and was never crowed and was beautiful. We were close to shopping, resturants and attractions but away from the crowds. Great family place. The home was spacious and we never felt crowded. The kitchen and bathrooms could be updated. We were only given 2 parking passes and we could have used more. The owners were very responsive and made our stay stress free. We are glad that you enjoyed Fenwick Island. Your description of the beach, restaurants, shopping and attractions is so accurate. It is unfortunate that you did not communicate your need for an additional parking pass to us, as we would have tried to accommodate you and your family. We hope you were treated to great sunsets off the back of the house and took lots of family photos. Thanks for choosing our home for your Fenwick 2017 vacation! We hope you’ll consider our home for another vacation! Donna, we are glad that you and your family had a wonderful time. The lovely beach and surrounding natural beauty make for a terrific vacation. Sunsets and stargazing on the back decks are some of our favorite things. Thanks for choosing our home for your stay. We'd love to have you return. Quiet community located on both the Little Assawoman Bay and Atlantic Ocean. Enjoy the solitude or head to town for breakfast at Jimmys, lunch at Just Hooked or dinner at One Coastal. Farmer's Market in Fenwick on Monday and Friday mornings. Enjoy early morning or early evening beach walks, kayaking or a bike ride. There is plenty to do or choose to do nothing! We keep a visitors binder at our home, with plenty of ideas for day trips, restaurants, etc. Please contact us if you have any questions. Linens, towels, paper/consumables ARE NOT included in rental rate. Rental is only confirmed AFTER receipt of executed lease, first deposit/security deposit & cleaning fee.